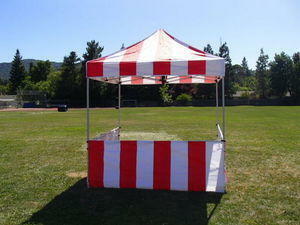 This Carnival Booth with Side Walls is great for your school carnival or a carnival themed event. It is 8ft x 8ft x 10tall This item must be able to be staked otherwise 2 canopy weights must be ordered to secure it. If you order without an inflatable a $40 Non-Inflatable fee will be added.